As the calendar turned to February here in Colorado, it looked for all intents and purposes like winter was over. I had heard that Boulder stays relatively mild in the winter, but these were some record-breaking times. A string of sunny but cool days ramped up aggressively to high temperatures of 63 on Thursday, Feb 4 and 72(!) on Friday, Feb 5. While these were beautiful conditions in pretty much any other time and place (Boston, we would’ve sent you some if we could! ), this was less than ideal in the middle of prime powder season. You know it’s bad when your local ski-snow forecaster resorts to giving thanks for his health, family and friends in order to put a positive spin on such a dry spell. So with the weekend of Feb 6-7 promising more brutally pleasant weather in Boulder (highs ended up hitting 73 and 66 for the two days) and rain (! @#$) at many of the ski resorts, we decided to take what nature was handing us and instead planned a summer-in-the-winter rock climbing weekend. 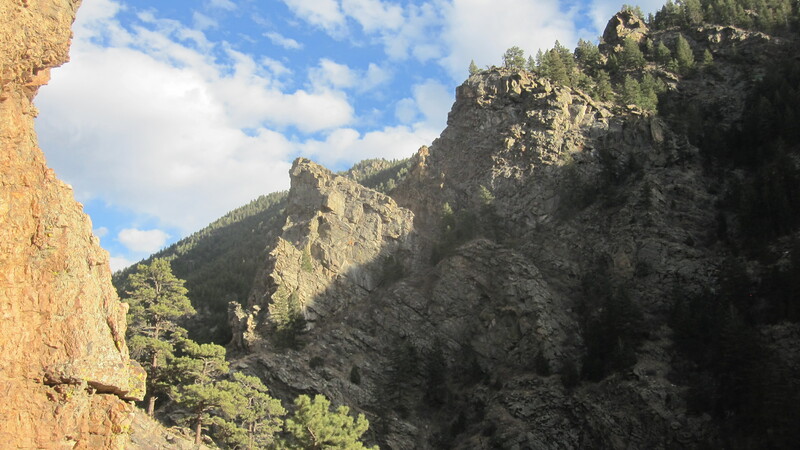 Our big plan Saturday was to check out Clear Creek Canyon, a famous climbing area on Highway 6 just west of Golden. According to our newest housemate, this area features great climbing and “holds you can actually hang on to.” In addition, we hoped would help us gauge the progress Teresa and I had made through the first three weeks of our power-endurance climbing training program, which had included fun training sessions (four climbs back-to-back!) and miserable ones (burpees and planks!). There are many climbing areas in Clear Creek Canyon, but the one we ended up at (after missing the parking area and a couple of subsequent u-turns) is called High Wire. It’s a super-popular area both for its accessibility and the large number of not-too-difficult routes. Sure enough, as we scrambled up the rocks next to the highway, we came upon what appeared to be a rock climbing class of 10-15 folks who had set up camp on the closest, easiest routes. We hiked on a bit to a slightly more secluded area called Left Wire which was not only not crowded but also faced south, allowing us to maximize our basking on this beautiful day. After picking out a spot, gearing up and refreshing some critical skills (so, uh…how do you build an anchor again? ), we were ready to go. “Is our mental game really that weak? Is being afraid to fall outside killing our strength that quickly? My second ascent of the route went no more smoothly, and after cleaning the anchors and rappelling, we plotted our next move, egos thoroughly battered. It didn’t help matters that during our struggles, a gaggle of female climbers had taken over the climb next to us and casually cruised up the 5.11b route in nothing but sports bras and spandex capris. We eventually, oddly, settled on the 5.9 slab climb slightly around the corner, because obviously if you’re having a stressful climbing day already, nothing will make you feel better than having the friction of your hands and shoes be the only thing keeping you from taking a sudden fall. Right. But Teresa led the climb successfully and I followed shortly afterward, so with a bit of confidence restored, we decided to try acouple of routes to our far left on crumbly pink stone, which the guidebook advertised as 5.10a. Perhaps once upon a time this pile of stone had sported sufficient holds to merit that rating, but today all that appears to be left between the first and third bolts are tiny edges and sharp pebbles, so not only are you thinking about how terrible the holds are, but you’re also taking bets on whether you’ll break your left or right ankle in the event of a ground-fall. After probably a good half-hour of flailing, I was able to clear the danger zone and actually enjoy what was a much better upper climb, and Teresa toproped it as the sun finally ducked behind the edge of the canyon. It wasn’t dark yet, so her rappel down to end the day made for some dramatic photos. After gorging ourselves on humble pie on Saturday, we decided to stay a bit closer to home on Sunday. 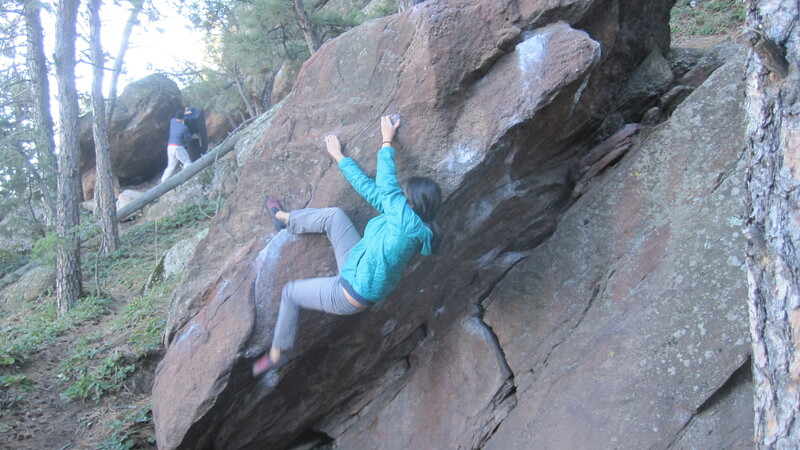 The sun was out and warm again, but the wind was whipping through so we decided to stay closer to the ground with some bouldering at Flagstaff, just up from town. 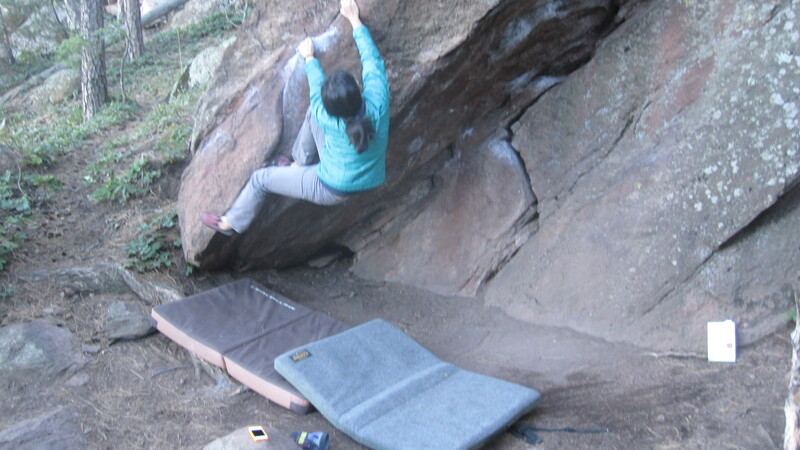 With crashpads on our backs, we wandered past many sunny areas full of people enjoying the weather and a few deserted areas with only scary highball problems on offer. Eventually, after much wandering, we found the appropriately named Nook Rock, which was deserted both because it was shaded and because you basically have to get lost to end up there. 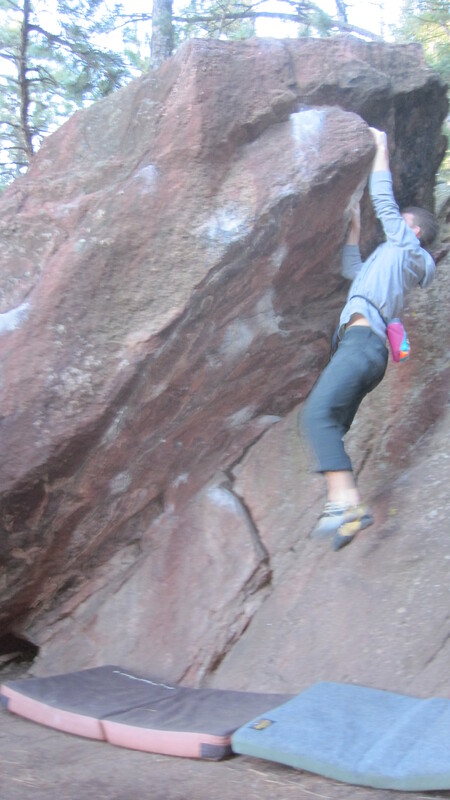 We warmed up with a few easy slab problems and quickly discovered that the hardest part was actually getting down from the top of the boulder. 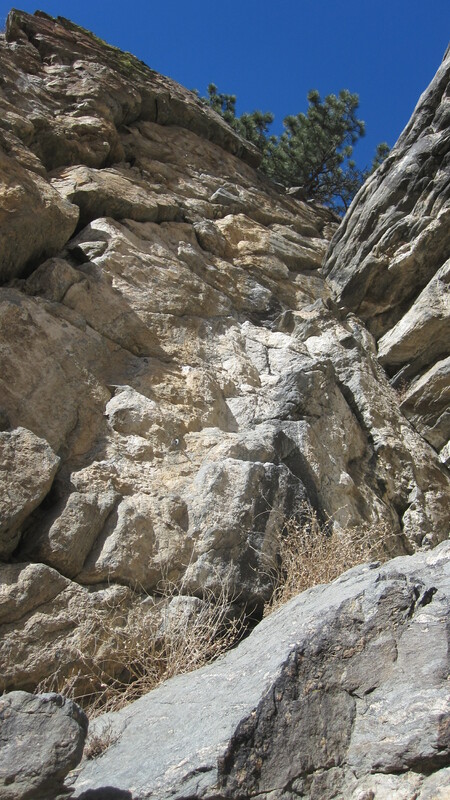 There was no easy walk-off, so the descent involved only marginally less friction than the ascent itself. While a couple of other folks projected a choice V4 nearby, we snuck around the corner where V7 traverse allegedly lives. With no chalk or clearly defined holds to guide us, we didn’t locate it, but instead created our own traverse out of a couple of small pockets and tiny pebble holds. It was relaxing to make up the sequence as we went and not feel like we had to pull out our guidebook every two seconds to see if we were using the “right” holds. 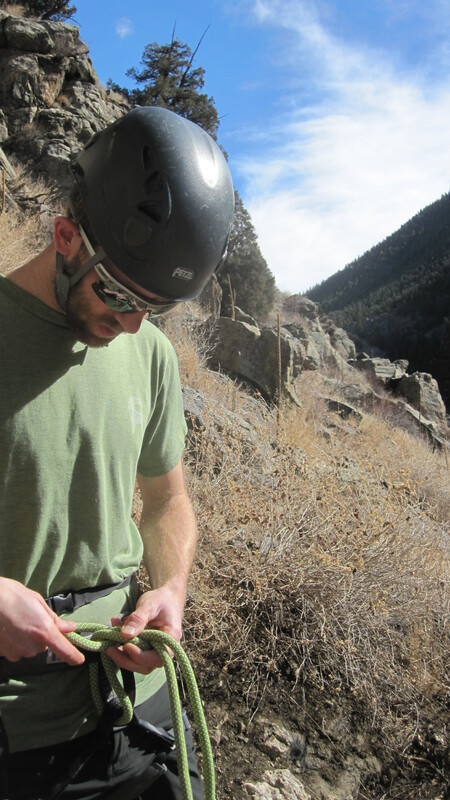 Eventually, we got on the V4 problem – “That Flakes It” – and enjoyed working the overhanging but well-defined holds. We wrapped up the day there, hiked back out to the car and headed downhill to home. So that was it, our way of making the best of our little blast of summer in the winter. As I write this, there are 4+ inches of new snow in the yard, so it looks like winter is back for the time being. 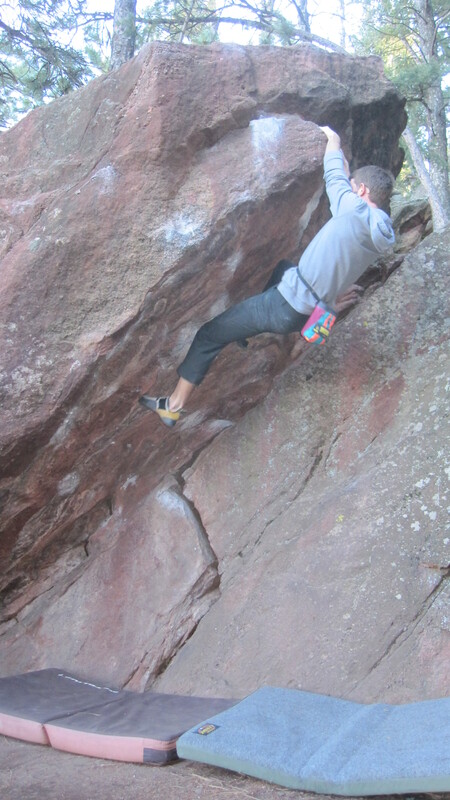 Oh, and after looking up our Clear Creek climbs on Mountain Project, we learned that our nameless 5.10b warm-up of doom was actually an 5.11a called “Pervade,” so it looks like we made the best of that challenge too!